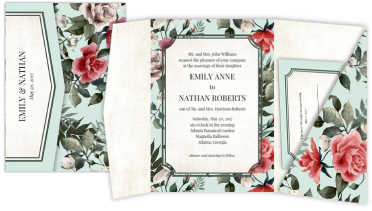 Vintage Wedding Invitations Rustic Wedding Invitations Personalized Wedding Planner New! Wedding Thank You Cards Custom Wedding Planners New! PurpleTrail offers easy customization with an online design center that lets you express your love story exactly the way you want. Shop from more than 1,000 designs in our curated collection to match every style or any ceremony, or create your very own – it’s all up to you. Pick your favorite fonts and change colors – all at no additional cost. Choose from any of our unique trim options and make a statement with your stationery. 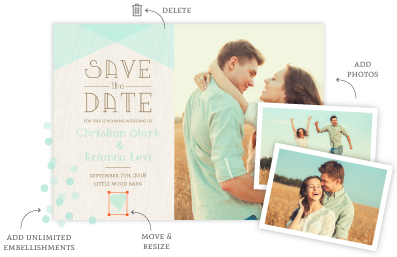 Add unlimited photos, search 1000s of embellishments and move, add or delete objects to create a design that uniquely celebrates your love. 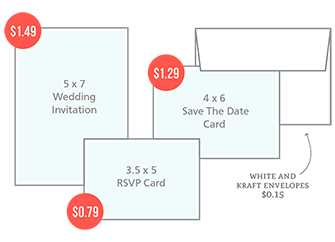 Create a coordinated suite and set the tone for your wedding celebration with enclosure cards for RSVPs, accommodations and more. 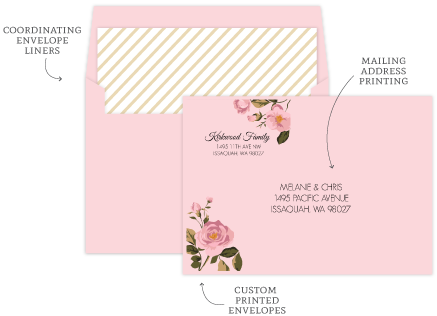 Easily create matching envelopes, liners and address labels to make your invitations a standout. Choose from 12 envelope colors and create the coordinating touches in our unique online design center. Bring the entire celebration together and customize coordinating designs for the ceremony and reception. 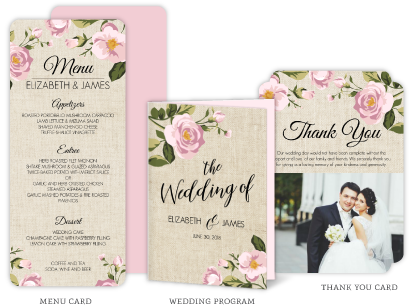 It’s fast and easy to create custom programs, menus, thank you cards and more to tie together your wedding vision. We know it’s your big day. We’re committed to the highest quality and customer care available so that you love everything about your wedding stationery. 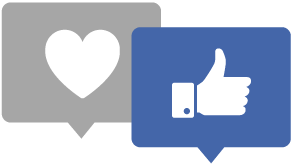 That means we pay extra attention to the details and offer a designer review and digital proof option to make sure your stationery is perfect. 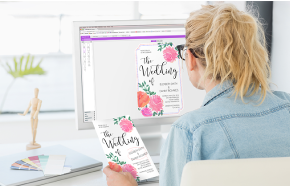 Unlike other services, we let you order just one of your final, personalized invitations so you can hold it in your hands and make sure it’s absolutely perfect. We get it. Then order as many as you need with the peace of mind they’ll be just what you want. 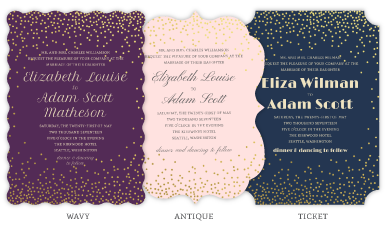 Make a bold wedding statement with our exclusive, all-in-one booklet invitations. These 8-page mini-books are fully customizable with unlimited text and photo options. There's room enough to include all your wedding details, accommodation information, a detachable RSVP card and more. 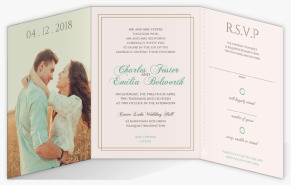 Invite friends and family to celebrate your big day with our unique tri fold invitations. 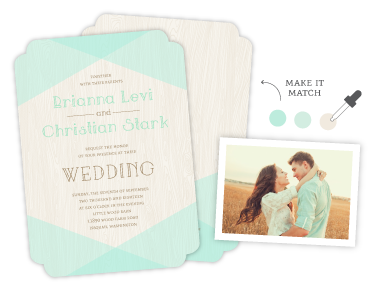 The flexible layout offers 6 panels to fully customize with unlimited photos, text and even an RSVP postcard. 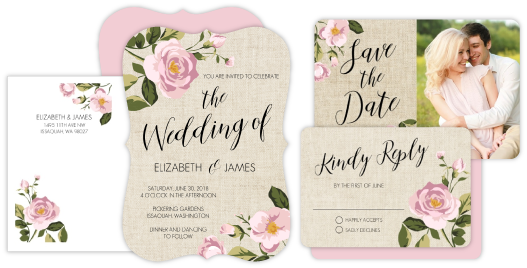 Available in 5x7 and 4x5.5 sizes, these all-in-one invitations are a customer favorite for their stylish looks and organization. 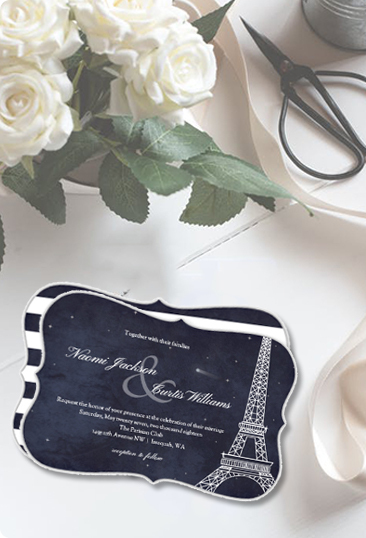 Personalize your wedding day celebration with our fully-printed pocketfold invitations in your choice of paper. Matching stationery fits neatly inside to keep all the details organized. Choose from a handpicked a selection of premium papers for your cards and invitations. You’ll find just the right card stock for your celebration. 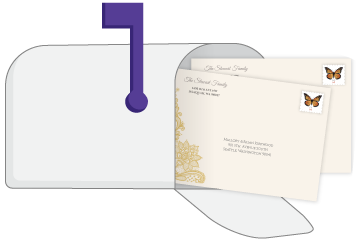 Let us address, stuff, seal, stamp and mail your cards or invitations directly to the recipients for you. You’ll love the extra time you save for things that are much more fun. 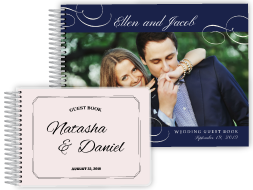 Preserve the well wishes from your friends and loved ones with customized guest books for all your wedding celebrations – showers, the ceremony, receptions and more. Choose from 4 inside page layouts or design your very own. Our bestselling Wedding Planner is the ultimate tool for planning the day of your dreams. 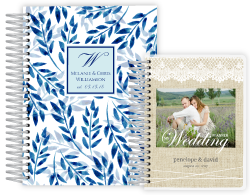 Customize the cover with photos, your name or the wedding date and choose from three cover styles and two sizes. It will kick off your planning now and be a keepsake for always! 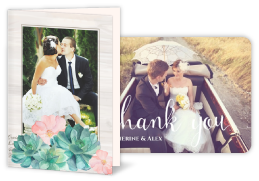 Say thank you in style with custom cards featuring wedding photos or your new married names. Our fully personalized thank you cards are the perfect way to remember all who made your wedding day so special. Our sample packs are a great way to see and feel our products so you know exactly what to order. 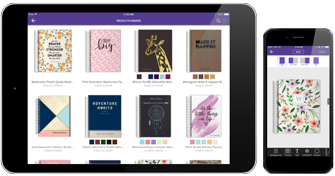 They’re pre-filled with a collection of our most popular designs and absolutely free!